Chester Point offers a total of 135 slips with full-fingered floating docks for both seasonal and transient boaters accommodating vessels up to 60 ft in length. Each slip features shore power and fresh water hook-ups, cable TV and Wi-Fi. On ground amenities include a marina lounge, AC bathrooms, showers, in-ground pool, picnic areas and coin operated laundry. Give us a call today to reserve your place at Chester Point. At Chester Point, we offer one of the largest and best-equipped land storage facilities in the area, with indoor and outdoor storage for up to 300 boats… now including Heated Indoor space! 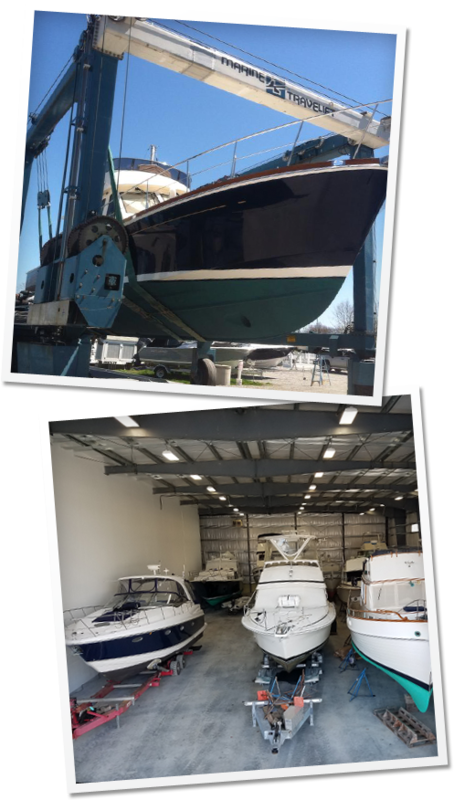 Our winter service prepares your boat for those cold winter months and includes hauling, pressure washing, rigging, storage and springtime launch. We service all types of vessels, both power boats and sailboats. Looking for a place to put your boat this winter? Contact us today for an estimate! Our 150 foot deep new heated indoor storage building makes a 50′ boat look small. Give us a call for all of your service needs! The service department at Chester Point has been delivering top quality service and maintenance for over 20 years. We are a true full-service yard, from launching and hauling to repairs and maintenance. Our technicians and craftsmen are highly trained with years of experience and are ready to help take the stress out of boat ownership. Chester Point Marina has a great family atmosphere making it the perfect stop during your cruise on the Connecticut River. Enjoy a short walk to the center of Chester for Restaurants, Museums, and Antiques (see all Chester has to offer at: visitChesterCT.com. Our transient packages offer access to all marina amenities. Take a swim in the pool, explore Selden Island, picnic on our tables overlooking the Connecticut River, and much more. Call 860-526-1661 for more info! We offer you a one-stop-shop for all your boating needs. Our ship store is stocked with a wide variety of marine supplies. Come in and browse through our selection of marine products. If we don’t stock what you’re looking for we can order it at competitive prices. While you’re visiting, don’t hesitate to ask a staff member for directions to local attractions. The store is open year round.